This recipe was shared by a friend of mine and this is the first time I’m trying out her recipe but I did not use brown sugar since it was not available at home and so I replace it with red sugar instead and I did not make it in a 9-inch pie pan but into 4 small pie pan and 1 rectangular pie dish. Also the original recipe used kuih lapis powder, since again I do not have it, I substitute it with mixed spices powder instead. – Combine flour and salt in a mixing bowl. Rub in the butter until the mixture becomes coarse bread crumbs. – Stir in the cold, a little at a time, kneading it until the crust mixture forms a ball. – Wrap dough in plastic wrap and refrigerate for 1 hour in the freezer. – Sprinkle flour onto rolling surface. Roll dough out, then divide in half. – Roll each half to fit a 9-inch pie pan. Place crust in pie plate, pressing evenly into the bottom and sides. – In a large bowl, toss the sliced apples with lemon juice. – Combine sugars, flour, cinnamon or mix spice powder. Add to the apples and toss well to coat. 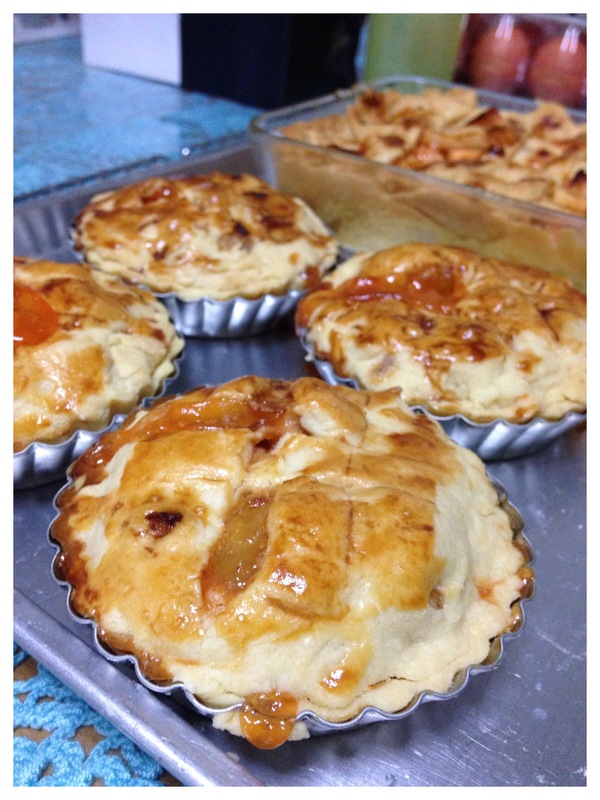 – Fill pastry lined 9-inch pie pan with apple mixture. 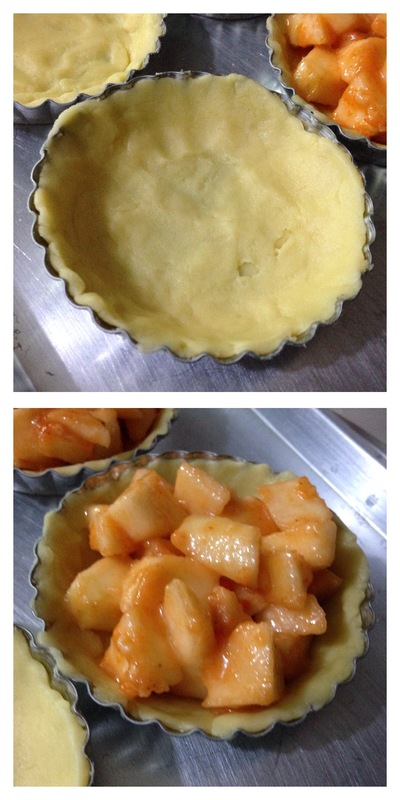 – Drop blobs of butter and place second crust on top of the filling, cut slits on top of crust to vent. Seal the edges of the crust with a fork or by hand. – In a small bowl, beat the egg yolk and milk. Brush the mixture over the top crust. – Cool for an hour before serving. 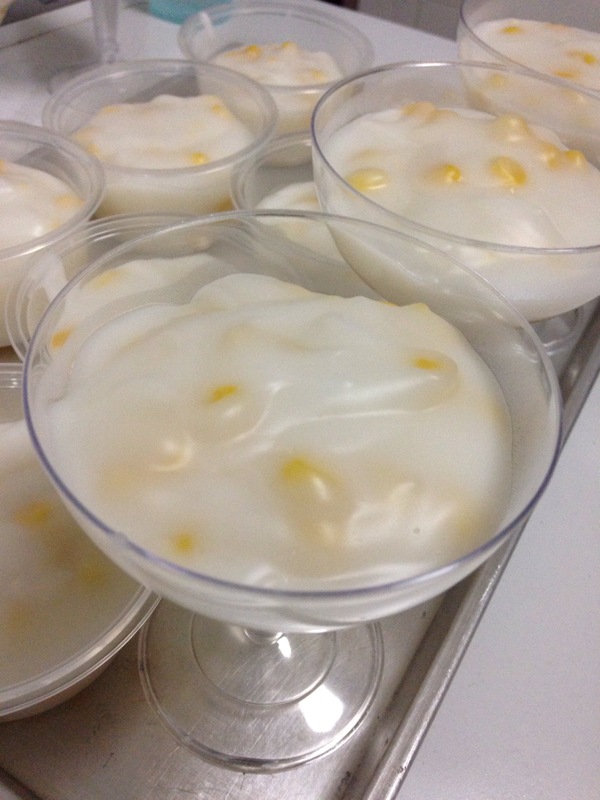 Hoon Kwee Jagung … a type of dessert that used Hoon Kwe flour (mung bean flour) and corns. 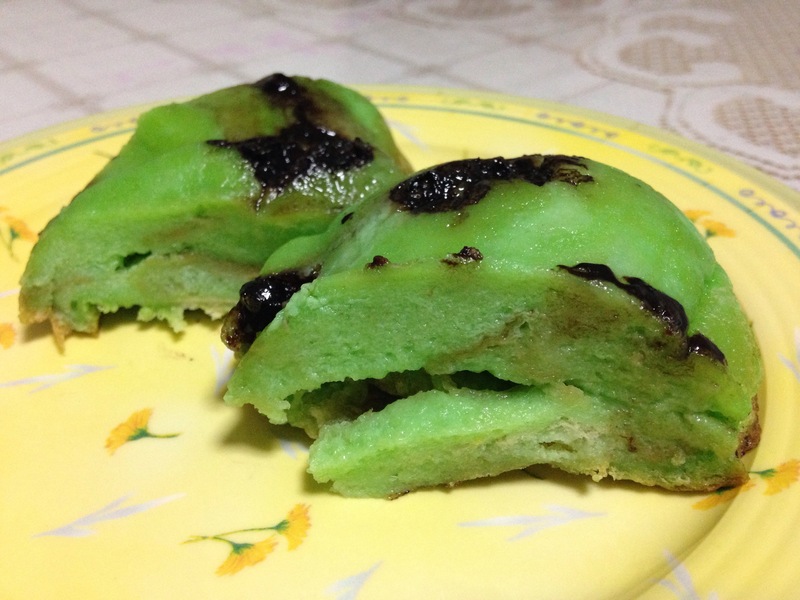 Traditionally in the Malay society we used to make using rice flour and we called it Nagasari … can either add banana or corn to it but now more people prefer to use the Hoon Kwe flour cos it tasted better and smoother in texture. I made these few days ago since there was a balance of the Hoon Kwe flour in the house. This dessert is easy and quick to cook. Boil these 3 ingredients and once sugar dissolved, off the fire and cool it. Mix both together till flour dissolved. In a pot, add the ingredient C. Then add ingredient B and the 250 ml coconut milk. Keep stirring and make sure to use a small fire. After 5 mins, add the corns. Continue to stir till mixture has thickens. Off the fire and pour the mixture into either small bowls, jelly moulds, cut banana leaves or plastic. Cool and chill in the fridge before serving. Note: if using banana leaves and plastic, cut into squares (dimension up to you) and pour the mixture before folding them nicely. I miss tinkering in my kitchen and so just now went about making this simple but delicious and fragrant bread pudding using screwpine paste (Pandan) and chocolate chips. 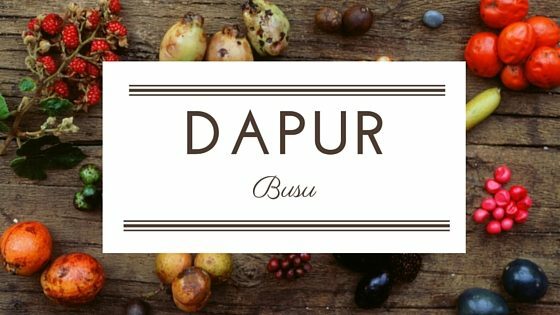 – Whisk together the milk, sugar, salt, eggs and pandan paste. – cut the breads into quarters and arrange into a baking pan. – pour the liquid mixture over the bread. – sprinkle enough chocolate chips all over it. Leave it aside for 15 mins. – after 15 mins, bake it in the oven at 170 degree C., for about 20 mins or until it becomes golden brown on top. You can serve the pudding with a side of ice-cream or just eat it as it is … really yummylicious! I like it! – spread butter on both sides of the breads and then cut into 4 triangles, arrange half the bread pieces into a small baking dish. I used a round aluminium tray. – Beat eggs, sugar, milk, vanilla essence and cinnamon powder togther in a mixing bowl. After which, add the raisins and stir. – Pour half of the milk mixture into the baking tray with the bread pieces, then add the rest of the bread pieces before pouring the rest of the milk mixture over it. – Leave it aside for about 10-15 mins. – Next, sprinkle generously the sliced almonds and chocolate chips on top. – Put into the oven. Baked in a preheat oven at 180 degree C., for about 25 mins or till its golden brown. – Cool and serve it with ice-cream or just as it is. In a bowl, mix the crushed biscuits with the melted butter. Spoon the crumbs into the baking tin, press well to make a pie crust. Chill for about 10 mins. Melt butter and sugar in a small pot with a low fire. Stir all the time and when sugar has dissolved, add in the condensed milk. Bring to a rapid boil for about 1-2 mins, stirring all the time, for a thick golden caramel texture. Before spreading the caramel, add and arrange the sliced bananas on top of the crust. Then spread the caramel over the pie crust, chill for about 1 hour. 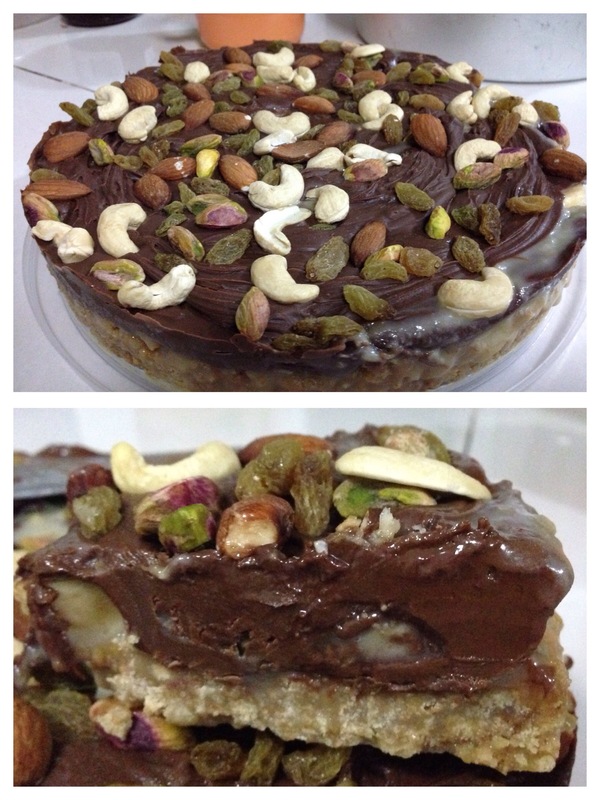 Next, spread the nutella on top and sprinkle the mixed nuts over it. Chill long enough or overnight till its ready to serve. 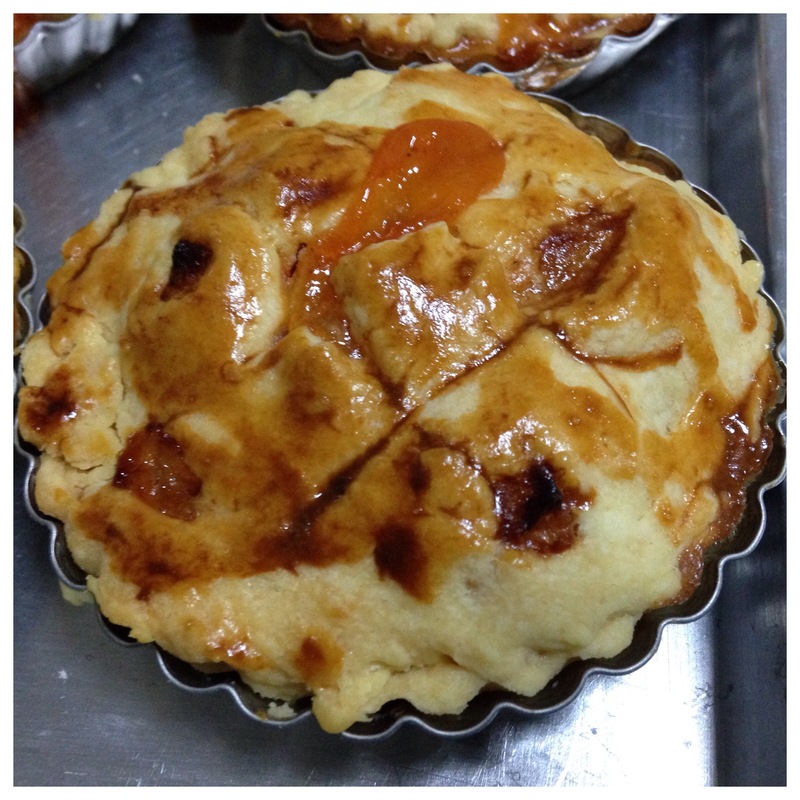 This is a spin-off from the original recipe of a Malay traditional cake…. 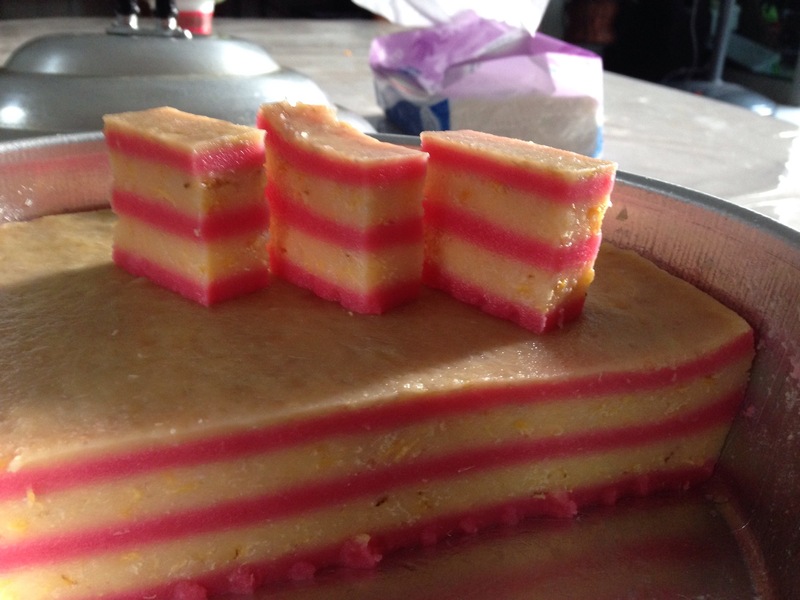 it’s called Kuih Lapis Pisang aka Steam Layered Banana Cake. 2 cups of coconut milk = 1 1/2 box of Santan Kara (coconut milk) + 1 cup of water. Mix the above ingredients together till sugar dissolve. Sieve and divide into 2 portions. Add to one of the portions. Mix well. Add to the final portion. Mix well. – Heat up the steamer. – Grease a cake tin with a bit of oil and let it steam for about 5 mins in the steamer. 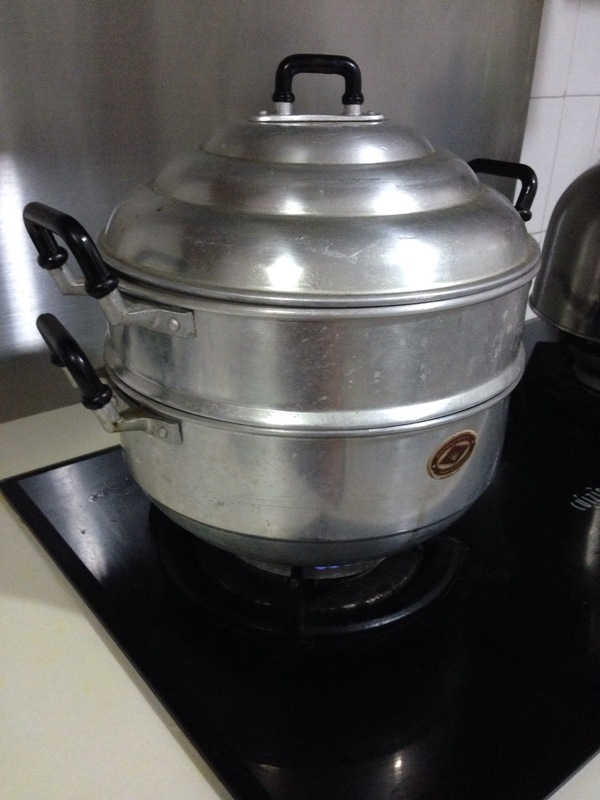 – Open the cover of the steamer, add 2 or 3 ladle full of the ingredients C first. – Closed the cover and let it steam for about 8 mins. – After that, add the next layer which is the Ingredients B. Add 3-4 ladle full. Steam for 8 mins. – Repeat the process till all the ingredients are used up. – After the final layer, leave the cake to steam for a longer period, about 20-30 mins. – Finally, leave it to cool before cutting it out to serve. Came back from work last night, sat down with kids while waiting for the evening prayer call when the urged to try out this recipe given to me by my colleague N. So without further ado, after the evening prayer, I started tinkering in my kitchen. In a medium size pot, mix the jelly powder together with the water, sugar and evaporated milk. Over a medium fire, stir the mixture till sugar are dissolve. Then add the custard powder (which you must add a bit of water to it and stir to ensure the powder are dissolve and no lumps). Keep stirring. Once the mixture has started to boil, lower the fire to a small one. Scoop out 2 cups of the mixture into a smaller pot. Keep stirring the first pot, I actually recruited my youngest daughter to help me to keep stirring while I focus on the smaller pot. Over at the smaller pot, add the milo, stir till there are no lumps to it. Off the fire. Scoop a bit of the milo mixture into the pudding mould (Just a thin layer about 0.5 cm or more, up to your preference actually). Cool it a bit in the fridge for about 2-3 mins. Then add the custard mixture, fill it till about 2 cm thick, arrange the oreo biscuits on it.and top more of the custard mixture over the oreo. Cool it for about 2-3 mins in the fridge again. Final layer, add the milo mixture again. 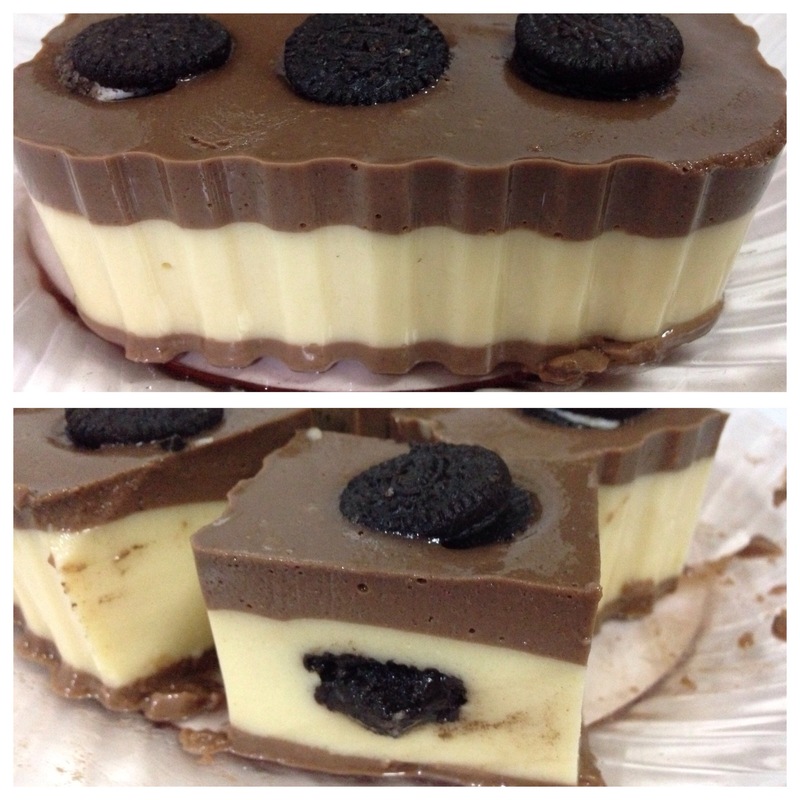 Then if you have extra oreo, can arrange them on top as decoration. Cool the pudding in the fridge … Serve cold when ready. 1. Add coconut juice from 4 young coconuts to plain water till it adds up to 3L. Bring it to boil. 2. Add 200 gm of sugar, coconut flesh and coconut jelly powder brand (Happy Grass Serbuk Jeli Kelapa) to the solution. 3. Mix well. Turn off the flame. 4. Pour into moulds and set the jelly in the refrigerator.